Welcome to the third and final Hooked on Holiday House Tours party of the year! Last week I showed you the white Christmas tree in my dining room. Today I’m inviting you into the family room where we spend the most time as a family. As much as I enjoy trying new colors here and there, I always need some good old fashioned Christmas red in the house this time of year. Can you see the snow falling outside the windows? You may recall I had a plan to put our tree in the new sunroom when it was finished. Well, my daughter Lily didn’t approve of that idea at all. She insisted that it HAD to be in the family room because it’s ALWAYS in the family room. I’ve only got this bad snapshot of it at night with bad lighting, but look how happy she is, triumphantly hugging “her tree.” It’s covered in ornaments that she and her brother Jake have made and collected over the years. If you missed my white tree in the dining room, you can see it here. Now it’s your turn to show us how you’ve been decorating! You’re Invited to My Annual “Hooked on the Holidays,” Show-Us-How-You-Decorate Party! Hi Julia, your family room looks fantastic! Hilarious what your Lily said! 🙂 Thanks so much for hosting, Merry Christmas! .-= Michelle @ Sweet Something Design´s last blog ..Haul Out The Holly Tablescape =-. Love those stockings. My husband still has the stocking that was made for him when he was a child! I have had to do a bit of work to catch up with that for everyone else in the household. That is hard to beat! .-= Christi at A Southern Life´s last blog ..Southern Christmas Table and Give-Away! =-. Love the decorations in your Family Room. I really like those chairs and they way they look with hints of red thrown in, very cozy! .-= Shannon´s last blog ..Our Holiday Home =-. Your home is gorgeous. So warm and cosy looking. Of course we’re in the middle of our (extremely hot) summer so I’m all about open and airy living. And air-conditioning! We only have one tree which is in the lounge room…it’s green with only gold and red stars, baubles and beads. .-= Becky @ Farmgirl Paints´s last blog ..bangs &amp cuffs =-. 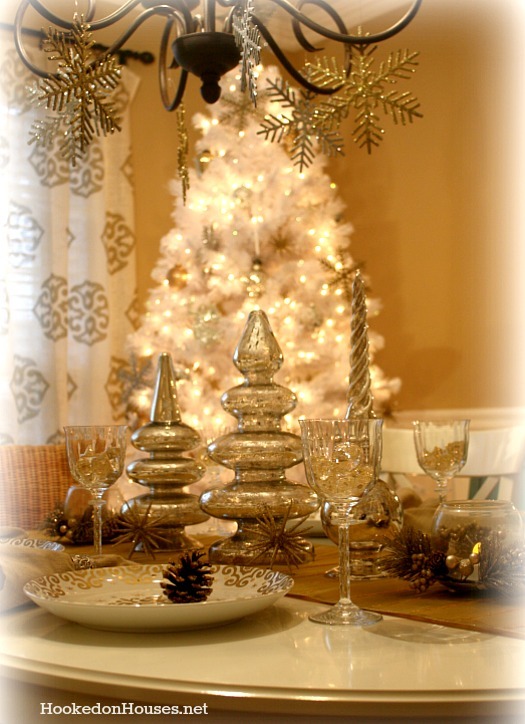 .-= Susan´s last blog ..Christmas Tablescape- Twelve Days of Christmas! Welcome to the 121st Tablescape Thursday! =-. .-= Shelia´s last blog ..Christmasing in the Dining Room =-. I love the family room decor. Loving the red and white. Those are my colors this year too. We have to let the kids win sometimes, right? Love her hugging the tree. Thanks for hosting so we can see all these great Christmas decorations. Julia – your home looks so so beautiful! I can tell you really enjoy decorating for the holidays. And how cute is your daughter?? 😉 She seems quite pleased that she won the tree battle!! I’m going to try to get some shots up, but might not make it in time. If not, I’ll have to link to my pre-decorating Shiny Brite post. It’s so fun to see everyone’s homes during the holidays. Thanks for the blog party…and Happy Holidays! .-= Kelly, Arte Styling´s last blog ..Stylish Blogger Award! =-. the red looks fantastic, especially next to your black and white chairs. love it! thanks so much for hosting, and hope you are having an excellent week. .-= the cape on the corner´s last blog ..Simple Card solution =-. Funny how kids are like that. I have a little one in the middle of everything I do. Your tree looks wonderful. Thanks for hosting and have a Merry Christmas. .-= Sherry´s last blog ..The Charm of Christmas =-. Really lovely Julia. I think red is such an appropriate Christmas color too. My husband pointed out to me recently that although most of our decorations are clear crystal (I’ve been collecting them for years) we have quite a lot of red. So festive. I really like the gold and silver that you have in the dining room too, simple and sophisticated. .-= kathysue´s last blog ..My 2010 Christmas Dining Room =-. Hi! Love your home! 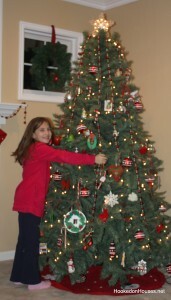 Funny, my daughter always wins about decorating the tree and how tradition CANNOT be changed, too! I needed to let you know I added 2 links by accident to the link-up party. I realized after I’d done it that I’d added the wrong one, so I added the one I wanted after and couldn’t get the first one off. The one that is wrong is “1850 Stone Home Christmas.” I wanted to enter the next one: “Stillness at Christmas.” I’m sorry. I’m sure you’re plenty busy, but I didn’t want you to think I was trying to sneak it by you. .-= Pumpkin Pie Painter´s last blog ..A Brief Moment in Time =-. This is so beautiful. I love that’s nothing “over-the-top”, nothing cluttered, everything has a very stylish and clean, yet “homey” look. I love your house. It’s so elegant and beautiful, Julia! You do a great job! Have a beautiful day and enjoy your beautiful decor! Love it!!! Lol – your daughter cracked me up – she is adorable! Feisty too! Have a Merry Christmas!! .-= Jess @ Frugal with a Flourish´s last blog ..Eight Great Christmas Gifts Under 10 =-. I just found your blog today. Wow…what a beautiful home you have. I can’t wait to explore your blog a little bit more tnight when I get home from work. I would love for you to drop by my blog https://cricketscafe.blogspot.com/ and take a peek. Tomorrow is Friendly Friday and there will be a contest and a cute prize to win. Take care and thanks for sharing all your talent and inspiration. .-= cricket´s last blog ..Traditional Holiday Recipes =-. Beautiful, beautiful, beautiful. I love how you decorate, Julia. Simple yet so elegant. .-= Sally´s last blog ..December Daily Day 12 =-. I love the stockings…so cute! I’m wondering if you made them? .-= Heather´s last blog ..Whistling a Happy Tune =-. I sent you an e-mail saying I got them at Target a few years ago, but now I’m second-guessing myself. I think it might have been Crate & Barrel. I went crazy when they had their red and white snowman-themed stuff several years ago and these might have been part of that collection. Does anyone remember? I also got plates, mugs, a tree skirt, etc, with the snowmen. Oh, Julia, I’m so glad to see the RED in your family room! I have loved at Christmas for more years than I care to count, and I don’t think I’ll ever change! Of course, I love decking the halls with real greenery, and red is the perfect complementary color. . . but mostly I just think I’m a traditional kind of girl. .-= Richella at Imparting Grace´s last blog ..A little more Christmas =-. P.S. Is your sunroom finished?? Great job Julia. So homey. Oh Julia, you are so going to get a third tree for next year! Don’t feel bad, I’m up to three now. I have one tree for the living room that is picture perfect and holds all my sentimental ornaments. Olivia has her own tree in our dining room that is bursting with colour (and almost falling over because she doesn’t believe in balancing the ornaments around the tree – she wants them all front and center “because they’re all so special they should be at the front.” Last year we added a tree to the rec room near the fireplace. We had to – what is cosier than twinkling Christmas lights and a warm fire? I’m all about traditional decor but this year I decided to go a little funky in our entrance. Lime green, purple, and silver – it is stunning but my tree will always be red and silver. Hope your sunroom is coming along nicely. I remember the sun…. we have about three feet of snow with more on the way today. It truly is a winter wonderland here. Ha, your daughter is a so cute! 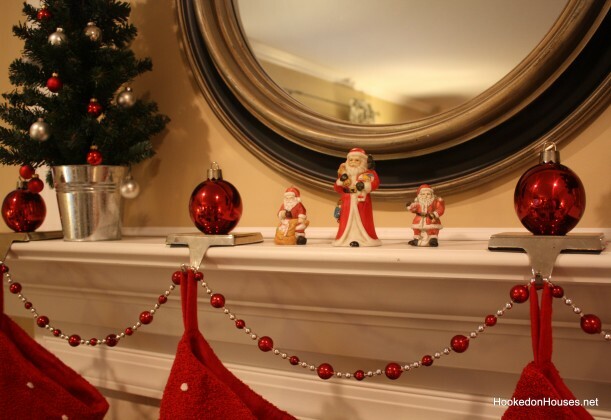 Your house looks really festive and I love how adorable your mantel is, I had to add a little red too, I really really missed red and it just didn’t seem like Christmas without it! You are lucky to have snow!! I wish we did. We had a snowstorm over Thanksgiving but I’m hoping for snow NEXT week! I love snow at Christmas! .-= melissa @ the inspired room´s last blog ..Preparing for Guests- 10 Tips =-. The keyword here is After Christmas Sale. Then you can have a sunroom tree, because you’ll never be able to move the green tree from the family room. Just go ahead and move it, and they’ll move it back for you, or you’ll find your family room looks bare without it! Happy Holidays! Thanks for hosting a beautiful Holiday home tour!!! .-= Amanda @ Serenity Now´s last blog ..Christmas Traditions =-. Oops…PS. Thank you for hosting!!! Your family room looks wonderful. I love the clean lines, the simplicity, and the traditional reds you’ve used! I read about your party at Susan’s BNOTP. It sounded like great fun! Thank you for hosting. .-= Bill @ Affordable Accoutrements´s last blog ..Holiday Decorating! =-. Thanks for hosting these beautiful tours. You know your family room is one of my favorites…I love the tasteful touches of red. Merry Christmas, my friend! .-= melissa*320 sycamore´s last blog ..deals 121510 =-. 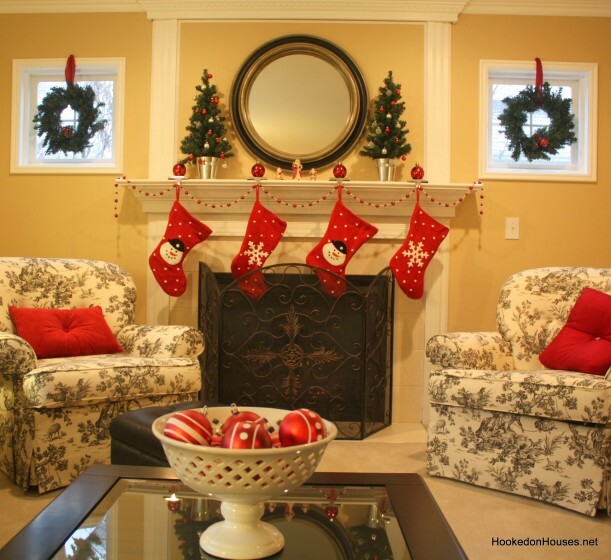 Love the red Christmas decorations with your black toile chairs. Tres chic. .-= down-sizingboomer´s last blog ..My Mr Big =-. I have been following you for a few years. I have loved all of your blog posts especially movie houses. I have learned so much from you. I love peeking into houses and see how people decorate and live. I have finally started my own blog and am extending an invitation for you to visit. I thank you for the inspiration you give me daily. .-= careyann´s last blog ..A Leap Of Faith =-. Julia your decorating style is Simply Elegant and I am quite jealous of your ability to do that. I watch the HGTV Christmas decorating tips to do and not do and I am guilty of the DO NOT make your house look like a Christmas museum. I tend to overdo and after being married 33 years I have stuff for every possible theme out there except the Simply Elegant one. Love the tours, so thanks for posting them. Your family room is so nice and cozy…I love all your decor…love those chairs on either side of the fireplace too! Having fun linking up to the Linky!! I just love blogging…..and you’re my first blog friend! XOXO I hope that you have a wonderful Merry Christmas! God bless you! P.S. You’re house is one of my most favorites! .-= Desiree @ chic coastal living´s last blog ..Coastal Connecticut Cottage =-. You truly have a home for all seasons…you have found the key to decorating with neutral background and accessorizing in different colors. It works so perfectly. By the way…I think Lily is the most perfect accessory of all! It’s so important for kids to feel the anchor of traditions, just like the tree in the corner…Yep..she won, and so did you by having her precious little self in your life! Now, I have to start looking at all those wonderful links!! .-= Pat´s last blog ..Preparing For… =-. I love your family room! The Christmas decorations are perfection. It’s so elegant and classic at the same time. I’m with you, I love the Christmas red. And now, in addition to your beautiful turquoise buffet, I am in serious love with your chairs! .-= Bre´s last blog ..Charity Poker Face =-. I also like a pop of red! I can’t wait to click on every single link… falalalala! Hi Julia everything you do is beautiful and Lily I’m glad you won because it looks fantastic and it looks even better with you beside it wouldn’t want it any other way. Julia I agree must have Christmas red it just seems to bring all the other colours to life I love it. Thank you for sharing it has been a visual feast. Regards Esther from Sydney. Hi, Julia…and Lily! Would I recognize some of those handmade ornaments, I wonder? I love your CHRISTmas decorations. They are classic and tasteful and so homey. Thanks for hosting and sharing so many great ideas! Merry CHRISTmas to you and your whole family! 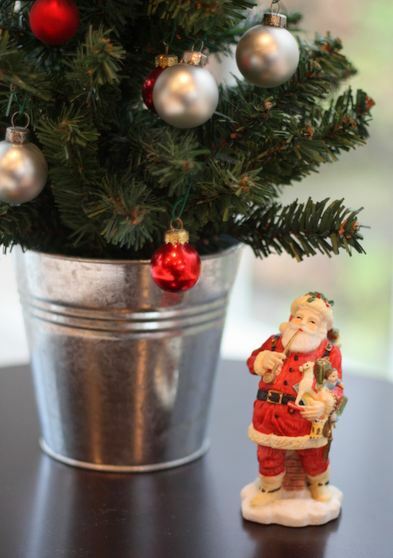 .-= Kristen @ JoyfullyThriving´s last blog ..CHRISTmas at Our Home =-. Christmas is all about the kids, so it’s right they get to choose! We had our chance, now it’s their turn. Lovely room. Love the black and white chairs too. The room looks sooooo neat and clean and unused. I just ordered two different sets of loveseat slipcovers because I don’t know which one I like and want to try them both. Hard on the credit card, but do you think it’s a good decision? The slipcovers are so different. The only reason it looks so neat and clean is because I picked up all the kids’ stuff before I took the pics. Ha. I know what you mean about slipcovers. I’ve bought several for the chairs in my bedroom but didn’t like any of them and sent them all back so I’m still shopping. Hope you have better luck with yours! Just beautiful Julia. Lily is quite proud of her tree placement! Too sweet. .-= Pam @ Frippery´s last blog ..Snowy Evening at Frippery Farmhouse =-. .-= Carmen @ Life with Sprinkles on Top´s last blog ..Our Christmas Tree =-. Thank you so much for hosting this Christmas party, It is so much fun looking at every ones Christmas decorations. Much better then any decorating magazine. My wishes being sent to you and your. .-= Sharon K´s last blog ..I wish you a Merry Christmas =-. Beautiful! And I especially love the two wreaths hung in the windows! .-= Lynda´s last blog ..HOLIDAY HOME TRANSFORMATION TIPS =-. Thanks for hosting the party-I hooked up late but HAD to hit your party again; it was a fun one for me last time! Merry Christmas to you! .-= Sue´s last blog ..Christmas in the Entryway =-. Thanks for hosting a wonderful Christmas party! .-= Julie´s last blog ..Welcome to our Home for Christmas 2010 please come inside =-. Hi there~ Love your family room- so warm and inviting. All linked up~ thanks for hosting! .-= Courtney´s last blog ..ILL BE HOME FOR CHRISTMAS =-. What a beautiful, beautiful home. As Ive told you before I have the same obsession with homes and you have a fabulous one to gaze into….thanks so much for sharing. I will definately be back ! Happy Holidays! .-= Melanie J´s last blog ..MICKEY MOUSE CLUBHOUSE BDAY Happy 4th Birthday Samayah! =-. Wow, can’t wait for the next holiday season and see what christmas decors would come up!